This is the design document for bugzilla 208274. The terminologies/acronyms below can be used throughout this document. Note: These definitions are not meant to be general definitions of these terms, but rather refer to how the terms are used within this design document as applied to COSMOS. CMDBf toolkit The code provided by COSMOS that interacts with the query and registration service framework, and provides the WSDM endpoints needed to communicate with the federating CMDB. It also includes the Eclipse tooling specified in this design. There are a number of manual steps that adopters are required to take when creating a data manager, MDR, or federating CMDB using the COSMOS framework. Much of these steps can be automated by an Eclipse-based toolkit that will greatly simplify the steps required for an adopter to use COSMOS framework. The toolkit should automatically generate code stubs, configuration files, and any other artifacts that will greatly simplify the procedure for adding a custom data manager to COSMOS. It should also allow for easy testing of data managers from within the Eclipse environment. The following have been identified as use cases related to this enhancement. Data manager is being created from scratch. This is addressed in Creating a new Data Manager project. Data manager is being adapted to existing data source. This is the case where the user imports an MDR into Eclipse. Users will create a normal Eclipse project, and then based on the config.properties and domainEPR.xml files, new manifest editor pages will be displayed for editing these. See Updating Data Manager Project. This is addressed in Updating Data Manager Project. Developer wants to start data manager in Eclipse. This is addressed in Deployment. Developer will install a set of plug-ins into the Eclipse workbench, and will download noted COSMOS prerequisites. If J2EE deployment is desired, the additional prerequisite of [WTP] will need to be installed. The plug-ins will be packaged such that if only OSGi deployment is desired, WTP will not be needed. org.eclipse.cosmos.me.dmtoolkit.dmtypes - List of specialized data manager types (e.g. MDR, federating CMDB). List of project creation wizard pages for specialized data manager types to enter custom properties (TBD). org.eclipse.cosmos.me.dmtoolkit.pkgtypes - List of packaging types (e.g. J2EE, OSGi). List of Export wizard pages for packaging type to enter custom properties. 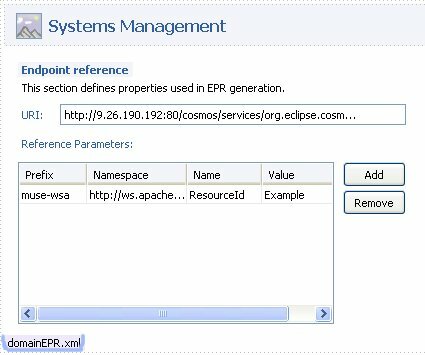 Examples and documentation on how to extend the COSMOS framework will be provided, integrated with the Eclipse help system. org.eclipse.cosmos.me.dmtoolkit.j2ee - contains code specific to the J2EE deployment scenario. This plug-in will have a dependency on the Eclipse Web Tools Project (WTP). org.eclipse.cosmos.me.dmtoolkit.osgi - contains code specific to the OSGi deployment scenario. This will be done last in case we cannot contain this for i9. The following sections describe the new UI workflows. The individual wizard pages will be presented the same in both J2EE and OSGi scenarios. In the J2EE scenario, the user would create a Dynamic Web Project in WTP, and would select facets that essentially provide "feature packs" for providing the functionality of custom wizard pages, generated code, and additional runtime requirements. This saves the need for subclassing the WTP wizards and allows for a more flexible design. The approach is explained well in this Eclipse.org tutorial article. The custom wizard pages added via the facets will have the same layout as those described in the OSGi section following. 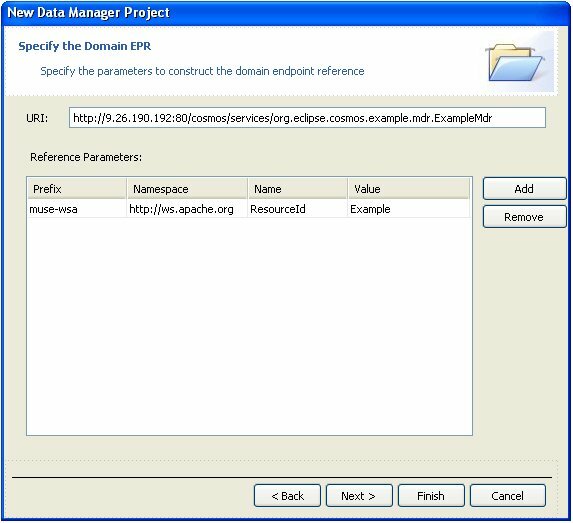 We will provide a new Eclipse menu option for creating a data manager project. As mentioned previously, this will greatly simplify the process and reduce the human error in configuring a data manager or MDR for use with COSMOS. The wizard for creating a data manager project will have the following responsibilities. Note: The *mdrname variable in the package names will use the value of the Data manager name field, in lowercase form, with spaces removed. The *userpackageprefix variable is a value supplied by the user to indicate the prefix for all generated package names. When the Create client plug-in option is selected, the user will be prompted for a custom class to be instantiated for the client. 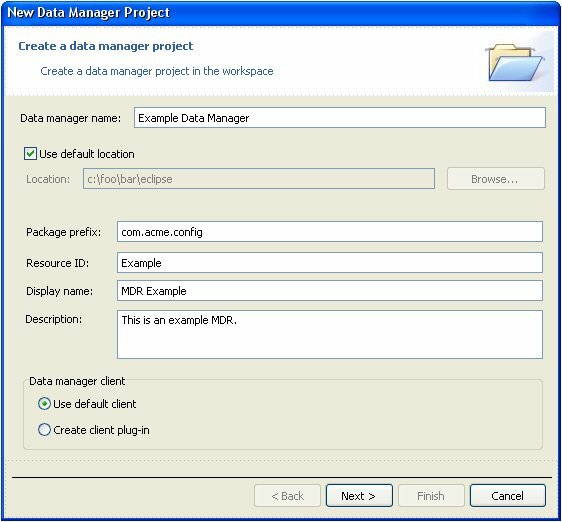 If Use default client is selected, the default implementation for the selected data manager type (e.g. MdrClient) will be used. Building EPRs by hand is a tedious and error prone activity. This is a place where UIs can be really helpful, since you can have integrated help, lists of valid values, and more readable labels. Plus, typing raw XML is laborious. This section defines a UI so users don't have to hand-code these EPRs. Here is a mockup for the input controls for generating an EPR, which will be on page 2 of the project creation wizard. Another extension point will allow adopters to provide custom wizard pages for the desired deployment target. These pages will allow input of target-specific properties. 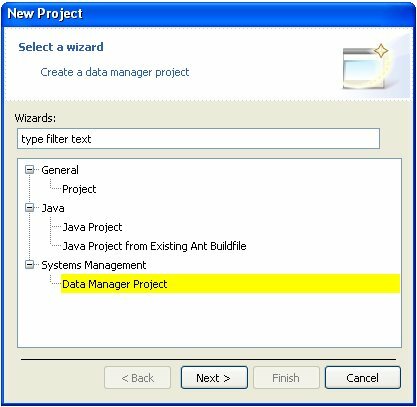 A wizard page will be displayed to prompt the developer for the type of data manager to be created. There will be a new extension point to supply the list of data manager types; the default implementation of the extension point will define the values "Standard data manager", "Management data repository (MDR)", and "Federating CMDB". For each type, other information such as icon, id, description, abstract parent class, and prerequisite plug-in will be indicated in the extension point. The icon, name, and description will be displayed in the page. There will be yet another extension point that specifies which data manager types are allowed for the desired deployment target (i.e. J2EE or OSGi); this subset will be presented for user selection. Another extension point will allow adopters to provide custom wizard pages for the selected data manager type. These will allow the input of properties unique to the data manager type. A valid use case is for a developer to want to change some of the initial project settings after the project has been created. We will provide an extra page on the project manifest that will allow several of the project parameters to be changed. We will need to be sure to preserve user edits to the project artifacts that are made outside our editors. 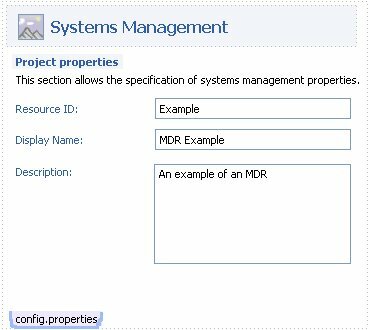 The following examples illustrate the artifacts that would be generated if a data manager of type "MDR" is specified in the project wizard. The contents of this file are built from the values entered on the first page of the project creation wizard. This file will also be updated when you change these values using the project editor wizard, which is opened when you edit this file in Eclipse. The contents of this file depend on the values entered on the Endpoint Reference page of the Project Creation Wizard. This file will also be updated when you change these values using the project editor wizard, which is opened when you edit this file in Eclipse. A developer will want to be able to import an existing data manager into Eclipse. We will need to provide an import wizard (using the Eclipse import dialog extension point) for the case where the data manager is not being built from scratch. The developer would select File > Import... from the Eclipse menu bar to navigate to this wizard. Because the generated project is a WTP dynamic web project, the developer can simply choose the Run on Server option to launch the data manager. The plugins will be exported using the standard Eclipse plugin export dialog, with the format of WAR specified. We will provide a context menu option for data manager projects as follows: Systems Management > Deploy.... This will allow the developer to run the data manager within Eclipse. The problem with using the standard Run... menu option is there are multiple, tedious steps involved in setting up the launch configuration. See COSMOS_Programming_Model#Running_the_MDR_within_Eclipse for an example of those manual steps. The new menu option will ensure all of these steps happen under the covers. A data manager project builder will be given a data manager properties object to execute. The test will assert the project was created with the desired characteristics. Variations will be tested for data manager type, deployment type, and other properties called out in this design. Invalid values, such as an existing project name, will be tested. The deploy action on a data manager project will be invoked. The test will confirm that this action results in a running data manager. All reviewer feedback should go in the Talk page for 208274. This page was last modified 19:53, 18 February 2008 by David Whiteman. Based on work by Hubert Leung, Mark Weitzel and Martin D Simmonds.